Hello all my bloggy friends and thanks for stopping by! I hope your week is going well for you. Mine is rolling right along and I'm slowly getting back into a routine now that VBS is over for another year. * Sentiment mat - Spellbinders "Labels 11"
I embossed the pink layer of the shoe with the Cuttlebug folder "Animal Prints". Then I covered the layer with VersaMark "Dazzle" Watermark Ink and sprinkled on clear embossing powder. After using my heat gun, I got this cool, shiny, leather look. A few gems along the heel really ups the "fabulous" appeal! 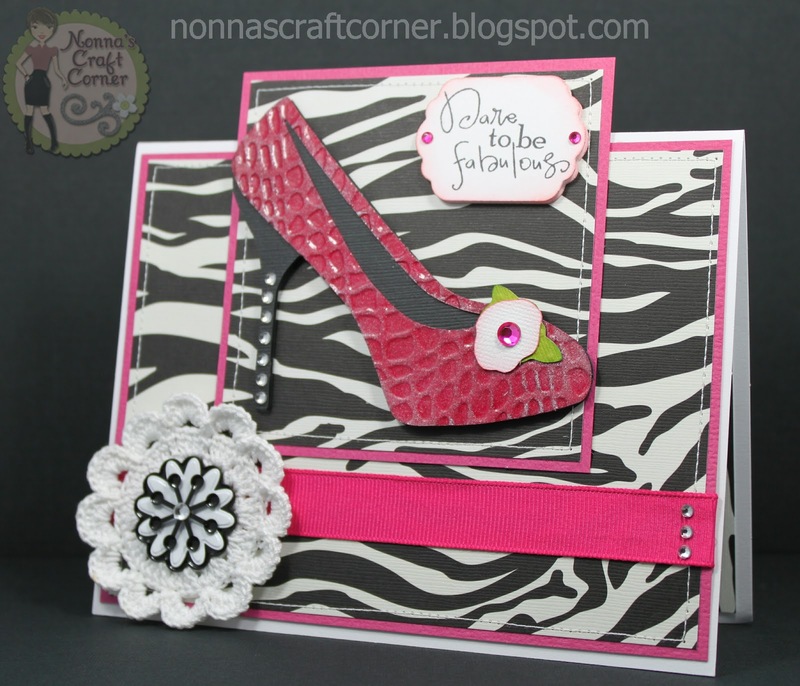 I had lots of fun putting together this fun, girly card! I hope you will stop by Tatiana's blog, Created By Tatiana and see more of her lovely crocheted embellishments. That's it for me today. Thank you so much for stopping by and as always, thanks for your sweet comments. I love hearing from each and every one of you! That shoe is perfect!! Super fun card! very cute love it TFS! What a wonderful card! Sassy! Love the card. I must make it for my daughter who loves shoes. Thanks for the inspiration. Wow, Tanya, my favorite combinations: black and hot pink, shoes and zebra print. My daughter would love the shoes - I mean, really, she's love a pair just like your shoe!! Adorable and I love the flower. Terrific card. 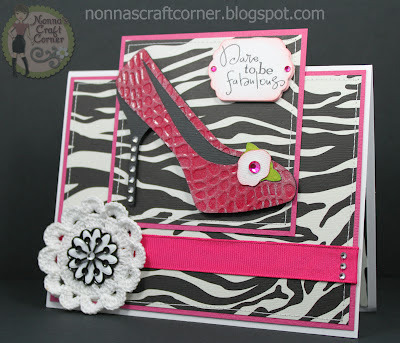 That shoe is amazing with the Cuttlebug embossing and then the embossing powder. this is so fabulous!! I love that shoe...I want that shoe, lol! Such a great layout and design-adorable crochet flower too! Love this-wait til Shelly from My Paper Love see's this....I think she "loves" shoes too! Tanya, this is terrific. Love the paper and colors. Gorgeous embossing on the shoe. This card is really totally FAB-U-LOUS!!! Really love the texture you got on the shoe!! I am definately going to try this!! This is out of this world!!!!!! I want to pull those shoes off that card and wear them! Sherrie mentioned your card, so glad she did. I love all your details too, that fabulous paper and the texture!!! So awesome, great job!!! Wow Tanya! This is a VERY cool card! The texture is amazing on the shoe! It's just fantastic! Those embellishments are wonderful! What a talent! Gorgeous! I would so wear those shoes. :) Love the embossing! Very pretty, I love all the texture, from the shoe paper, to the rhinestones and the crocheted flower. The zebra print is an excellent choice too! Thanks for sharing! So fabulous! What a beautiful card! !